Two days of digital media literacy and fun for middle and high school youth (ages 11-18). Media and arts organizations will offer free tools and workshops for youth to play with the web, remix, remake, and recreate to save the earth. Free digital media workshops including: 3D printing (faces and action heroes); claymation studio; DJ turntable skills; environmental poetry and issues; filming and digital flipbooks; lego building; mobile citizen journalism video-making; multi-plane animation; motion gaming technology and 3D avatars; recording and radio broadcasting; PopCorn and Thimble toolkits. Saturday, Oct. 27, 1-5 p.m. Partner organizations: Anticlockwise Arts, Bay Area Video Coalition, California Academy of Sciences, Children’s Creativity Museum, KQED, Mozilla Hive NYC, Project Level, San Francisco Public Utilities Commission; Sunset Neighborhood Beacon Center and SCREAM, TILT (9th Street Film Center), Type A Machines, Walt Disney Family Museum, WritersCorps, San Francisco Public Library and Friends of the San Francisco Public Library. For more information or class reservations, email jennifercollins@sfpl.org or call 415-557-4268. Books, bridges, butterflies and batman are among the artwork featured in the Library card design finalists now posted at ImproveSF.com. The Mayor’s Office and San Francisco Public Library created the challenge at ImproveSF to encourage artists of all ages to design the next San Francisco Public Library cards. 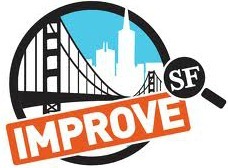 The public is now encouraged to vote for the library card finalists through ImproveSF.com ImproveSF is a citywide program that generates opportunities for the City and Country of San Francisco and its residents to work together via online community challenges voted on by the public. Registration at ImproveSF.com is required to vote for any of the design entries. The deadline for voting is Oct. 28. Artwork entries were accepted in five categories, divided by grade or age: 2nd Grade and under; 3rd-5th Grades; Middle School; High School; and Adult. In all, more than 3,600 designs were submitted for the contest and were winnowed to 10 in each category by a panel of judges that included author Lemony Snicket, author/illustrator Ashley Wolff, artist Sirron Norris, Suzee Barrabee, with the advertising firm, Goodby, Silverstein & Partners, City Librarian Luis Herrera, San Francisco School Board member Hydra Mendoza, the education advisor to Mayor Lee, and library graphic designer Barbara McMahan. The winning library card designs in each age/grade category will be announced in November. The five winning designs will be featured on new San Francisco library cards issued in 2013. There are more than 400,000 San Francisco library cards in active circulation. San Francisco Public Library issues about 60,000 new cards each year. One City One Book 2012 program. The featured event of the program will be Oct. 11, 2012, 6 p.m., with author Solnit in conversation with San Francisco Fire Chief Joanne Hayes-White, on disaster and democracy. The talk will be at the San Francisco Main Library, 100 Larkin St.
A Paradise Built in Hell explores our need for community and common purpose, which Solnit argues are fundamental to democratic forms of social and political life. Rebecca Solnit is the author of 13 books about art, landscape, public and collective life, ecology, politics, hope, meandering, reverie, and memory. hey include Infinite City: A San Francisco Atlas, a book of 22 maps and nearly 30 collaborators, Storming the Gates of Paradise; A Field Guide to Getting Lost; Hope in the Dark: Untold Histories, Wild Possibilities; Wanderlust: A History of Walking and many others. 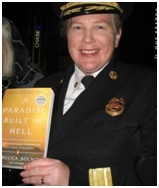 Joanne Hayes-White was sworn in as the 25th Chief of the San Francisco Fire Department on January 16, 2004. San Francisco is the largest urban fire department in the world with a female chief. Prior to her appointment as Chief, Hayes-White served as the Director of Training for the San Francisco Fire Department, where she oversaw recruit training, in-service training, continuing education, and Firefighter-Paramedic cross training. Chief Hayes-White has been recognized by the San Francisco Business Times as one of the City’s Most Influential Women of the Year every year since 2004. In 2012, as part of the 8th annual citywide book club program, the Library is participating in California Reads, a statewide reading and discussion program created by Cal Humanities in partnership with the California Center for the Book and supported by the California State Library. 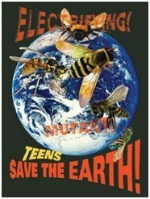 California Reads encourages Californians from all walks of life to participate in reading and discussion programs and related activities around the theme of democracy in 2012. San Francisco selected A Paradise Built in Hell because of its strong connection to the city and its exploration of the aftermath of the 1906 earthquake. A Paradise Built in Hell blends reportage and analysis, as it surveys natural and man-made disasters including the ’06 earthquake, the Halifax explosion of 1917, the 1985 Mexico City earthquake, the Sept. 11th attacks, and Hurricane Katrina. Solnit takes a positive view of human behavior showing that disasters can actually create a sense of community and purposefulness. A community’s typical response to catastrophe is self-organization and mutual aid–truly democracy in action–with neighbors and strangers rescuing, feeding and housing each other. Through the fall, the Library is offering a number of discussion groups, films, preparedness workshops and more events on the theme of the book. Visit sfpl.org/onecityonebook for more information about programs, book club discussion questions and more, and start reading the book now. Lois Lowry’s breakthrough dystopian young adult novel, The Giver, has been read by millions around the world and is assigned reading for thousands of middle school students. The book left many with lingering questions, including: “What happened to Jonas and Gabriel?” and “Is a perfect society possible?” Now Newbery-award winning Lowry has followed up with Son, the final book in The Giver quartet, and will be at San Francisco’s Main Library to discuss this final installment and answer all your questions. Tuesday, Oct. 9, 6 p.m. Published in 1993, The Giver is an intriguing story set in a society that is uniformly run by a Committee of Elders. Twelve-year-old Jonas is assigned his life’s work as the Receiver, which gives him the burden of holding the community’s memory. It teaches him the cost of living in an environment that is “without color, pain, or past.” Jonas grows increasingly aware of the hypocrisy that rules his world. With a storyline that hints at Christian allegory and an eerie futuristic setting, Lowry makes real the abstract concepts, such as the meaning of a life in which there are virtually no choices to be made and no experiences with deep feeling. With Son, Lowry continues to wrestle with the idea of human freedom while completing the story of Jonas and the baby he rescued. Told in three separate story lines, it combines elements from the first three novels into a thought provoking narrative. “Son is a tender conclusion to this memorable story, and definitely the best of the books in this sequence since The Giver itself,” according to School Library Journal review. Lowry’s has written more than 20 books for young people including the Anastasia Krupnik series. Her book topics span a wide range, including humor, science fiction and thought-provoking works. A book signing will follow the discussion at the Library.